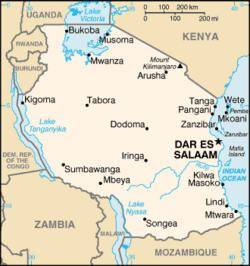 Tanzania, officially the United Republic of Tanzania, is a nation on the east coast of Africa. The name is derived from Tanganyika, its area on the mainland, and the Zanzibar islands off its east coast. In 1964, Tanganyika united with Zanzibar, forming the United Republic of Tanganyika and Zanzibar, later renamed the United Republic of Tanzania. Though containing abundant natural resources, they remain undeveloped, resulting in 80 percent of the population relying on agriculture to survive. 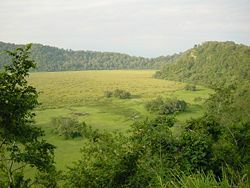 The Tanzanian geography is one of the most varied and unique in the world; it contains Africa's highest and lowest points, and contains lakes, mountains, and many nature reserves. Mount Kilimanjaro, Africa's highest peak, is situated in the northeast. To the north and west are the Great Lakes of Lake Victoria (Africa's largest lake) and Lake Tanganyika (Africa's deepest lake, known for its unique species of fish). The great Serengeti plain stretches across Tanzania and its neighbor, Kenya. The socialist policies of the first president, Julius K. Nyerere, severely hampered economic growth and led to widespread food shortages when the farming collectives failed. Though those policies were largely abandoned in 1985, their effects linger in terms of low levels of foreign investment. The government is still completely dominated by one ruling party, with the opposition intimidated and harassed. Northern Tanganyika's famed Olduvai Gorge has provided rich evidence of the area's prehistory, including fossil remains of some of humanity's earliest ancestors. Discoveries suggest that East Africa may have been the site of human origins. The area is believed to have been inhabited originally by ethnic groups using a click-tongue language similar to that of southern Africa's Bushmen and Hottentots. Although remnants of these early tribes still exist, most were gradually displaced by Bantu farmers migrating from the west and south and by Nilotes and related northern peoples. Some of these groups had well-organized societies and controlled extensive areas by the time the Arab slavers, European explorers, and missionaries penetrated the interior in the first half of the nineteenth century. The coastal area first felt the impact of foreign influence as early as the eighth century, when Arab traders arrived. By the twelfth century, traders and immigrants came from as far away as Persia (now Iran) and India. They built a series of highly developed city and trading states along the coast, the principal one being Kibaha, a settlement of Persian origin that held ascendancy until the Portuguese destroyed it in the early 1500s. The Portuguese navigator Vasco da Gama explored the East African coast in 1498 on his voyage to India. By 1506, the Portuguese had claimed control over the entire coast, though this control was nominal because they did not colonize the area or explore the interior. Tanganyika as a geographical and political entity did not take shape before the period of imperialism; its name only came into use after German East Africa was transferred to the United Kingdom as a mandate by the League of Nations in 1920. What is referred to here therefore is the history of the region that was to become Tanganyika. In 1698 and again in 1725 the Omanis ousted the Portuguese from the trading ports on East Africa's coast, most notably from Kilwa and Zanzibar. During the eighteenth century, Zanzibar had emerged as the dominant port of the region. Trade in general had prospered, and a chain of coastal trading towns, among them Tanga and Bagamoyo, had emerged. Bagamoyo, a name derived from the term "Bwaga Moyo," which means "throw your heart away," was a major port for the shipping of slaves. In 1841, Sultan Sayyid Said moved his capital from Muscat to Zanzibar; with him came many Arabs who invigorated the economy. In 1856, the sultanate of Zanzibar was separated from the sultanate of Oman; the island of Pemba as well as the coastal lands, including Kilwa, belonged to Zanzibar. Arab traders established caravan routes into the interior, using camels. Slaves were among the most profitable of their trading goods. The port of Zanzibar was visited by Dutch, English, and French ships. The British East India Company had a representative on Zanzibar, who acted as an advisor to the sultan. In 1873, a British fleet forced Sultan Barghash to declare the end of the slave trade. Although reduced, an illegal slave trade continued. In 1848, the German missionary Johannes Rebmann discovered Mount Kilimanjaro; in 1858, Sir Richard Francis Burton and John Speke discovered and mapped Lake Tanganyika. In 1886, the British and Germans partitioned the region among themselves; the sultanate of Zanzibar, now reduced to the islands of Zanzibar and Pemba, remained independent for the moment. 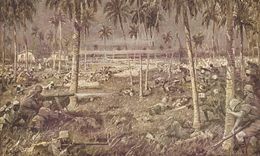 The Germans exercised their authority with such disregard and contempt for existing local structures and traditions and with such brutality that in 1902 a movement against forced labor began along the Rufiji River and spread. Known as the Maji Maji War, this was a merciless rebellion and by far the bloodiest in Tanganyika, with indiscriminate murders and massacres perpetrated by all sides against farmers, settlers, missionaries, planters, villages, indigenous people, and peasants. After Germany's defeat in World War I, the mandate to administer Tanganyika was conferred on the United Kingdom by the League of Nations. The United Kingdom transferred the provinces of Ruanda and Urundi, in the northwest, to Belgium. These provinces contained nearly half the population and more than half the cattle of the colony. The administration of the territory continued to be carried out under the terms of the mandate until its transfer to the Trusteeship System under the Charter of the United Nations in 1946. British policy was to rule indirectly, i.e. through African leaders. In 1926, a legislative council was established to advise the governor. The British took measures to revive African institutions by encouraging limited local rule and authorized the formation in 1922 of political clubs such as the Tanganyika Territory African Civil Service Association. In 1926, some African members were unofficially admitted into the Legislative Council, and in 1929 the association became the Tanganyika African Association, which would constitute the core of the nascent nationalist movement. In 1945, the first Africans were effectively appointed to the Governor's Legislative Council. Tanganyika first achieved autonomy and then full independence from the United Kingdom in 1961. In 1963, Zanzibar achieved independence from the United Kingdom in the form of a constitutional monarchy under the sultan, but a popular revolt in 1964 against the sultan soon led to the unification of Zanzibar with Tanganyika to form the United Republic of Tanzania. At the time of independence, Tanzania had only 12 university graduates. In 1967, President Nyerere embarked on a policy of "self-reliance," based on cooperative farm villages and nationalization of factories, plantations, banks, and other private enterprises, based on the East bloc model of development. The program failed completely, due to corruption, inefficiency, and tribal resistance, and was dismantled by Nyerere's successor. In 1979, Tanzania declared war on Uganda after Uganda tried to annex the northern Tanzanian province of Kagera. Tanzania not only expelled Ugandan forces but invaded Uganda itself, overthrowing Idi Amin with the help of Ugandan and Rwandan guerrillas. Amin fled into exile. Nyerere handed over his power to Ali Hassan Mwinyi in 1985, but retained control of the ruling party, Chama cha Mapinduzi (CCM), as chairman until 1990, when he handed that responsibility to Mwinyi. In October 1995, one-party rule came to an end when Tanzania held its first ever multiparty election. However, CCM comfortably won the elections and its candidate, Benjamin Mkapa, was subsequently sworn in as the new president. In December 2005, Jakaya Mrisho Kikwete was elected the fourth president for a five-year term. One of the deadly 1998 U.S. Embassy bombings occurred in Dar es Salaam on the east coast of Tanzania, its largest city and former capital. The other was in Nairobi, Kenya. Tanzania's president and national assembly members are elected concurrently by direct popular vote for five-year terms. The president appoints a prime minister who serves as the government's leader in the National Assembly. The president selects his cabinet from among National Assembly members. The constitution also empowers him to nominate 10 non-elected members of parliament, who also are eligible to become cabinet members. Elections for president and all National Assembly seats were held in December 2005. The unicameral National Assembly includes representatives from the mainland and Zanzibar, as well as special seats reserved for women. At present, the ruling CCM holds about 90 percent of the seats in the assembly. Laws passed by the National Assembly are valid for Zanzibar only in specifically designated union matters. Zanzibar's House of Representatives has jurisdiction over all non-union matters. The semiautonomous relationship between Zanzibar and the union is a relatively unique system of government. Tanzania has a five-level judiciary combining the jurisdictions of tribal, Islamic, and British common law. Appeal is from the primary courts through the district courts, resident magistrate courts, to the high courts, and court of appeals. Judges are appointed by the chief justice, except those for the Court of Appeals and the High Court, who are appointed by the president. The Zanzibari court system parallels the legal system of the union, and all cases tried in Zanzibari courts, except for those involving constitutional issues and Islamic law, can be appealed to the Court of Appeals of the union. A commercial court was established in September 1999 as a division of the High Court. In 1996, Tanzania's capital was officially moved from Dar es Salaam to Dodoma, although many government offices still remain in the old capital. For administrative purposes, Tanzania is divided into 26 regions (mkoa), 21 on the mainland and five on Zanzibar. Ninety-eight districts, each with at least one council, have been created to further increase local authority. In 2007, there were 114 councils operating in 99 districts; 22 are urban and 92 are rural. 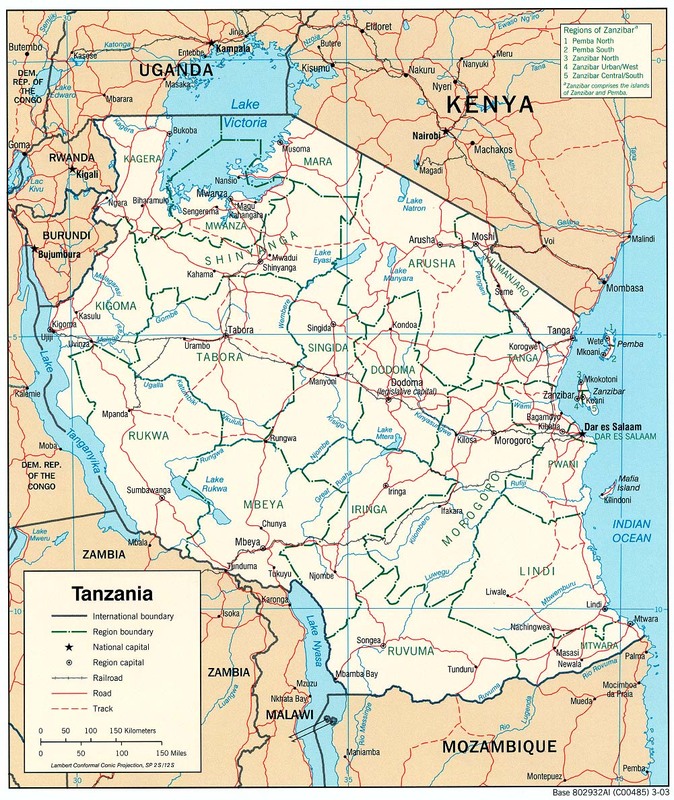 Tanzania is bordered by Kenya and Uganda on the north, Rwanda, Burundi, and the Democratic Republic of the Congo on the west, and Zambia, Malawi, and Mozambique on the south. To the east it borders the Indian Ocean. It is the world's 31st-largest country (after Egypt), comparable in size to Nigeria and about half the size of the U.S. state of Alaska. This nation's geography is one of the most varied and unique in the world; it contains Africa's highest and lowest points, and contains lakes, mountains, and many nature reserves. The northeast of Tanzania is mountainous, and includes Mount Meru and Mount Kilimanjaro, both of which are active volcanoes. Kilimanjaro's natural beauty, as well as the fact that it has the highest peak in Africa, attracts thousands of tourists each year. West of these mountains is Serengeti National Park, famous for its annual migration of millions of white bearded wildebeest, as well as its abundance of lions, leopards, elephants, rhinoceroses, and Cape buffalo. Close to the park lies Olduvai Gorge, where many of the oldest hominid fossils and artifacts have been found. Other archaeologically important finds include the oldest evidence of hominids' use of wood at the Kalambo Falls, on the border with Zambia. Further west is Lake Victoria, on the Kenya–Uganda–Tanzania border. This is the largest lake in Africa and is traditionally named as the source of the Nile. Southwest of this, separating Tanzania from the Democratic Republic of the Congo, is Lake Tanganyika. This lake is estimated to be the second-oldest (and second-deepest) lake in the world after Lake Baikal in Siberia. Tanzania contains many large and ecologically significant wildlife parks, including the famous Ngorongoro Crater, Serengeti National Park in the north, and Selous Game Reserve and Mikumi National Park in the south. Gombe National Park in the west is known as the site of Dr. Jane Goodall's studies of chimpanzee behavior. 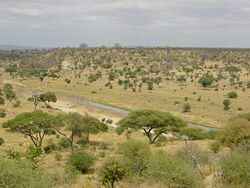 The nation contains considerable land area of wildlife habitat, including much of the Serengeti plain, where blue wildebeest and other bovids participate in a large-scale annual migration. Up to 250,000 blue wildebeest perish each year in the long and arduous movement to find forage in the dry season. Tanzania has developed a "Biodiversity Action Plan" to address species conservation. The center of Tanzania is a large plateau, with grasslands and national parks to the south and arable land further north. The new capital, Dodoma, is located here, although much of the government is still located in Dar es Salaam. The eastern shore of Tanzania is hot and humid, and encompasses Tanzania's largest city and former capital, Dar es Salaam. Just north of Dar es Salaam lies the island of Zanzibar, a semi-autonomous territory of Tanzania, which is famous for its spices. Its lesser-known sibling Pemba lies further to the north. The climate of Tanzania ranges from hot and humid on the coast, to a more temperate climate in the elevated center of the country. Tanzania has two rainy seasons; a long heavy one from March to May, and a shorter, lighter one from November to January. The economy of Tanzania is heavily dependent on agriculture, which accounts for half of its GDP, provides 85 percent of exports, and employs 90 percent of the work force. Topography and climatic conditions, however, limit cultivated crops to only 4 percent of the land area. Industry is mainly limited to processing agricultural products and light consumer goods. The World Bank, the International Monetary Fund, and bilateral donors have provided funds to rehabilitate Tanzania's deteriorated economic infrastructure. Tanzania has vast amounts of natural resources including gold deposits. It also has beautiful national parks that remain undeveloped. Growth from 1991 to 1999 featured a pickup in industrial production and a substantial increase in output of minerals, led by gold. Commercial production of natural gas from the Songo Songo island in the Indian Ocean commenced in 2004, with natural gas being pumped in a pipeline to the commercial capital Dar es Salaam. The bulk of it is converted to electricity by the public utility and private operators. A new gas field is being brought on-stream in Mnazi Bay whose estimated reserves significantly exceed those of the Songo Songo gas field. Population distribution in Tanzania is extremely uneven. Density varies from one person per square kilometer (3/mi²) in arid regions to 51 per square kilometer (133/mi²) in the mainland's well-watered highlands to 134 per square kilometer (347/mi²) on Zanzibar. More than 80 percent of the population is rural. Dar es Salaam is the largest city and the commercial capital; Dodoma, located in the center of Tanzania, is the new capital and houses the Union's Parliament. Zanzibar Town houses the Zanzibar Parliament. The African population consists of more than 120 ethnic groups, of which the Sukuma, Haya, Nyakyusa, Nyamwezi, and Chagga have more than one million members. The majority of Tanzanians have Bantu origins. Groups of Nilotic or related origin include the nomadic Masai and the Luo, both of which are found in greater numbers in neighboring Kenya. Two small groups speak languages of the Khoisan family peculiar to the people of the Kalahari in southern Africa. Cushitic-speaking peoples, originally from the Ethiopian highlands, reside in a few areas of Tanzania. Other Bantu groups were refugees from Mozambique. Although much of Zanzibar's African population came from the mainland, one group known as Shirazis claims its origins to be the supposed early Persian settlers. Non-Africans residing on the mainland and Zanzibar account for 1 percent of the total population. The Asian community, including Hindus, Sikhs, Shi'ite and Sunni Muslims, and Goans, has declined by 50 percent in the past decade to 50,000 on the mainland and 4,000 on Zanzibar. An estimated 70,000 Arabs and 10,000 Europeans reside in Tanzania. Each ethnic group has its own language. No language is de jure official, but Swahili is the national language, used for intertribal communication and for official matters; thus Swahili is de facto official. After independence, English, the language of colonial administration during the era of British rule, was still used for some official issues, and was thus considered de facto official alongside Swahili. Official usage of English has greatly diminished during the first 30 years following independence, and it became more common to regard Swahili as the only de facto official language. However, the political reforms that turned Tanzania away from a closed and socialist environment and a centrally planned economy inevitably resulted in a dramatic opening up of the country. The attendant growth of the private sector and new investment has resulted in English having increasing importance, and there are a plethora of schools in which English is the medium of instruction. Universities all use English as the medium of instruction, which often causes problems for students who have previously only taken English as a subject in school. Other spoken languages are Indian languages, especially Gujarati, and Portuguese (both spoken by Mozambican blacks and Goans). It is hard to say what the largest religion in Tanzania is since this question, together with tribal affiliation, has not been included in the national census. According to the CIA World Factbook, Muslims account for 35 percent of the population, an estimated 30 percent of the population is Christian, and 35 percent adhere to traditional faiths. On Zanzibar, the population is 99 percent Muslim. Wherever the Swahili-speaking people traveled, Tarabu culture moved with them. It has penetrated as far as Uganda, Rwanda, and Burundi in the interior of East Africa, where Taarab groups compete in popularity with other Western-music-inspired groups. In recent years, a new generation of musicians has emerged that is creating popular tunes that are Tanzanian in composition. These musicians have managed to curve a new tune, distinct from imported Zairean tunes, and are competing with Zairean bands in popularity and audience acceptance. The mushrooming of FM music stations in the late twentieth century and reasonable production studios has been a major boost to the music industry in the country. Contemporary artists command a huge audience. Education in Tanzania consists of seven years of compulsory primary education, four years of junior secondary, two years of senior secondary, and up to three or more years of tertiary education, which includes courses offered by higher education institutions. But there are shortages of schools, teachers, books, and instructional materials to meet the demand. UNICEF reported that primary school attendance was 47 percent for boys and 51 percent for girls. But only 2 percent of boys and 3 percent of girls attend secondary schools. Children are required to learn both Swahili and English. English is taught as a compulsory subject in primary grades, whereas in post-primary education it is the medium of instruction. ↑ Department of Economic and Social Affairs Population Division (2009). World Population Prospects, Table A.1. Retrieved October 24, 2011. ↑ 3.0 3.1 3.2 3.3 Tanzania. International Monetary Fund. Retrieved October 24, 2011. ↑ Tanzania Petroleum Development Corporation, SongoSongo Gas-to-Electricity Project. Retrieved March 18, 2007. ↑ BBC News, Tanzania's Leader Snubs New Jet, October 6, 2004. Retrieved March 18, 2007. ↑ Ally Saleh, Drought Cutting Tanzania’s Power Supply, Reuters News Service, January 9, 2006. Retrieved June 18, 2007. ↑ Jonathan Power, A New Lodestar for Africa? International Herald Tribune, December 1, 2006. Retrieved March 18, 2007. ↑ Mwambao, Taraab. Retrieved March 18, 2007. Central Intelligence Agency. Tanzania. The World Factbook. Retrieved June 18, 2007. U.S. Department of State. Tanzania. Retrieved June 18, 2007. All links retrieved November 16, 2015. Country profile: Tanzania BBC News. This page was last modified on 16 November 2015, at 16:58.